Exquisite year round comfort awaits you with our most luxurious white goose down comforter. An upgrade to our Deluxe Comforter, with a higher silky-soft thread count and increased amount of fluffy fill. When only the best will do! What a great down comforter! It's very light and yet we don't need extra blankets on these cold winter nights. The little loops on the corners are very convenient for attaching a duvet cover. Terrific product. Sleep is precious so why settle for anything less than our exquisite Luxury Year Round Comforter? From the moment you glide your hand across the incredibly soft and silky 680 thread count 100% cotton cover you will be smitten with the gorgeous quality of this mid-weight comforter. 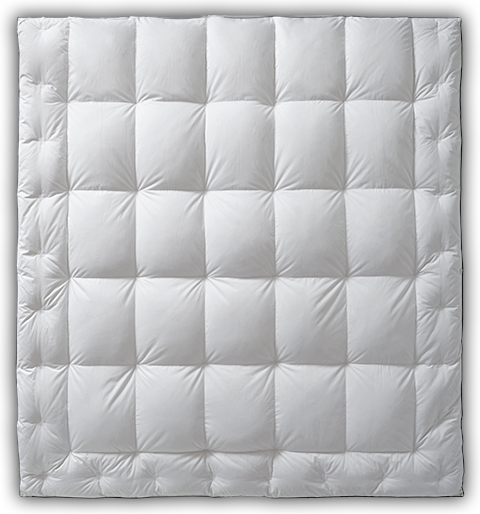 Within the true baffle box construction, fluffy extra-large clusters of 700 fill power Hyperclean white goose down will tempt you to enjoy its enveloping comfort night after night. True baffle box means that inside, three dimensional fabric boxes create room for a higher loft while the Comfort Lock® no-shift border keeps the fluffy white goose down distributed evenly over top of you instead of letting it migrate to the bottom and sides. Navy blue cording outlines the perimeter of this Luxury Year Round Comforter and the included diagonal corner loops are very convenient for attaching a duvet cover. This design upgrades from our Deluxe Comforter and is an excellent, 5-star choice. < This Pacific Coast® comforter features our distinctive Comfort Lock® three-sided border system designed to hold the down in the center, over your sleep area instead of shifting to the bottom and edges. Evenly spaced cross stitches within the border work to keep the down in place giving the border its fluffy, well-filled look. Instead of wasting down on the sides and bottom of your bedding like ordinary comforters, Comfort Lock® allows us to use the down much more efficiently to provide you with cozy warmth. Warmth Provides cozy year round warmth in a wide range of climates.